Hey there, I'm Dan! I am originally from North Carolina in the USA, but I've been in New Zealand with YWAM for the better part of two and a half years now. Since I arrived and did my DTS here in Tauranga in 2012, life has been a constant adventure, and God has repeatedly stretched my understanding of Him and given me new challenges. 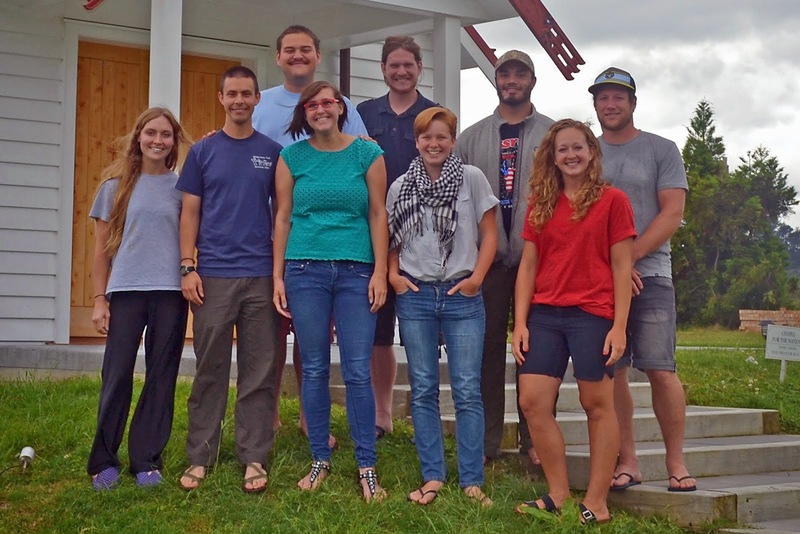 The most recent of these was to lead this Pilgrimage DTS, and now it's time to break some more new ground on a South Island backpacking outreach! I'm so stoked to partner with the Holy Spirit as we tell people the good news, seeing people encouraged, loved, and healed as we do! It's going to be so good! Hey, I'm Mallory and I'm actually from Minnesota. I'm the wild and crazy leader that loves to laugh. July 2013, God led me to this amazing country to do my DTS. God wrecked me in amazing ways since then and given me a passion to love people into freedom. I am so excited to be partnering with God in doing his work on the South Island. I can't wait to see what all God is going to do! It's going to be a crazy adventure! My name is Bethany Clapper and I'm from Turlock, California. I have a passion for exploring the great outdoors, snowboarding, and anything art-related. :) I look forward to sharing these interest with others on outreach. Hello my name is Connor Martinez and I'm from Clovis, California. I love God, America, hunting, and backpacking. I'm excited to go to the South island and tell people about God. Hi, I'm Julie, the frenchie of the group. I grew up in a city close to Paris so mountains are not my natural environment, but since I have began hiking here in New-Zealand, I love it ! It is kind of a dream being real for me to be in New Zealand, I am always amazed by the wonderful creation of God, it just blew my mind! I am so excited to go to the South Island with my team, I know that God has prepared crazy stuff for us, it is gonna be an epic adventure ! I am Kent. I am a pilgrim from Denver, Colorado. I enjoy the bush and have spent a lot of time tramping in the United States as well as in Switzerland and New Zealand. My experiences in the bush have given me strength and times to reflect on life. Back at home, I have the honors of Ranger and Eagle Scout in the Scouts. I, also, have always had an allure for stories in a wide variety of forms. I love a good tale and see life as one large epic. I am excited to see what God brings in our outreach and who we will meet. I look forward to sharing life with my team and meeting people of the trail. Hey, my name's Isaac - I'm from New Jersey! Backpacking was pretty new territory for me until I came here to New Zealand, and I gotta say it's been pretty great! Seeing how creative God can be and seeing part of his creation has been amazing. I'm excited to see what he has my team do in the south island, and I'm especially excited to go exploring there as well! Hi, this is Andrew Wiegand. I'm from the eastern part of Pennsylvania. Nothing reflects the Creator better than His creation and I hear that the south island is filled with splendor. With my passion for hiking over mountains, rock climbing, surfing, mountain biking, snowboarding and sport touring, it fills me with excitement to be heading off to the South Island. What I'm looking forward to the most, is running in to others that share this passion in hopes that I will be able to connect on a heart level and spread the love of Christ! Hi my name is Crystal. I'm from Pennsylvania, but in my heart, New Zealand is my other home. I came to New Zealand with my husband, Andrew, and together we've absolutely loved exploring and experiencing the beauty that New Zealand holds. I never get tired of fresh mountain air, a quality cup of coffee and meeting new people. I'm excited for this time!